Objectives: Delivery is a painful process and may impose different mental effects on the mother. The present study investigated the relationship between forgiveness and spiritual well-being on the mother’s anxiety during her labor. Materials and Methods: This is a cross-sectional and descriptive-analytic study. The research population included all the pregnant women who referred to three maternity hospitals affiliated to Shiraz University of Medical Sciences. 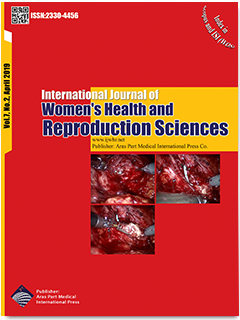 In addition, the sample contained 200 pregnant women (both the prime and multiparous mothers) based on multiple regression analysis and 10 samples were selected for each variable of the study. The Paloutzian and Ellison Spiritual Health Scale, Pollard Forgiveness Scale in Family and Spielberger’s questionnaire were used to collect the data. Results: Based on Pearson correlation test, variables of the study demonstrated a significant relationship and the correlations between spiritual health and trait anxiety of the mothers, state anxiety, and the total score of anxiety were r=-0.329, -0.385, and -0.363, respectively. Further, a significant relationship was observed between mother forgiveness and mother’s anxiety (r= -0.352), the state anxiety (r = -0.39), and the anxiety variable (r = -0.377) (P = 0.001). Conclusions: In general, there was a significant negative relationship between spiritual health and forgiveness with the state, trait, and overall score of anxiety.